A hacker hanging out over at MobileRead Forums has come up with a way to expand the abilities of the two-year-old Onyx Boox M92 ebook reader. He's modified a version of the open-source Linux distro Ubuntu so it can run on the M92's 9.7" E-ink screen. 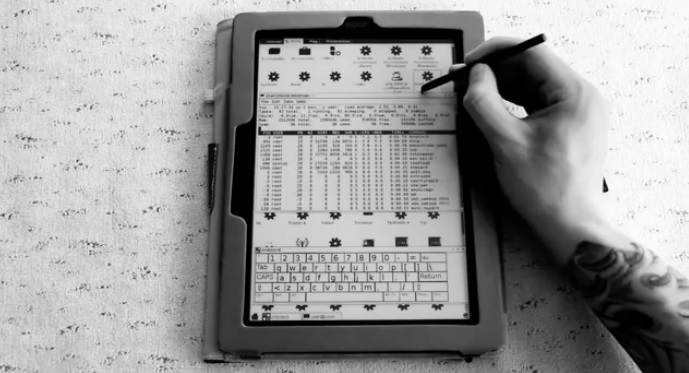 Initially released last July, Obuntu turns the M92 into an E-ink Linux tablet. With an 800MHz CPU and 256MB RAM, it's a slow tablet but it is a tablet nonetheless. As you can see in the video below, Obuntu includes many common parts of Ubuntu as well as calibre, all of which can be access via the M92's Wacom touchscreen. Obuntu also supports Bluetooth and Wifi, opening up opportunities for browsing the web and using a Bluetooth keyboard. The following video shows off the install process and takes the Obuntu firmware through a couple tricks. You might want to turn off the sound. Even though it was first shown off last year, this project only crossed my desk today. It is currently in a semi-finished state, and several of the early testers have struggled to get it to install correctly so you might want to avoid it. Obuntu is currently in hiatus, but the developer insists that he hasn't abandoned it. In March he said that he planned to revisit the Obuntu and finish his work so that it would be easier to install. Although the idea is pretty cool, it is almost useless due to the weak hardware. Try to install the Firefox, Chromium Browser. The installations are smooth but the versions are too outdated to be practical. Even I can not open the Hotmail or Google Mail. The Google Docs takes forever to load the file I want. DO NOT expect too much! But still thank seaniko for his great job. This isn't the first time someone has used Linux to turn an ereader into a tablet, and I can report that the other project has had more success. Late last year another developer revealed an unrelated project to develop a Debian Linux firmware for Kobo ereaders. That project went much better and the software is currently being used by several Kobo owners. The Kobo devices have smaller screens but otherwise similar specs, and they run Debian Linux just fine.